Hawkeye alumni have great expectations for the upcoming football season, and why not? Many starters return from the squad that last year finished 11-2, chalked up Iowa’s first BCS bowl win, and finished the season ranked No. 8 in the nation. 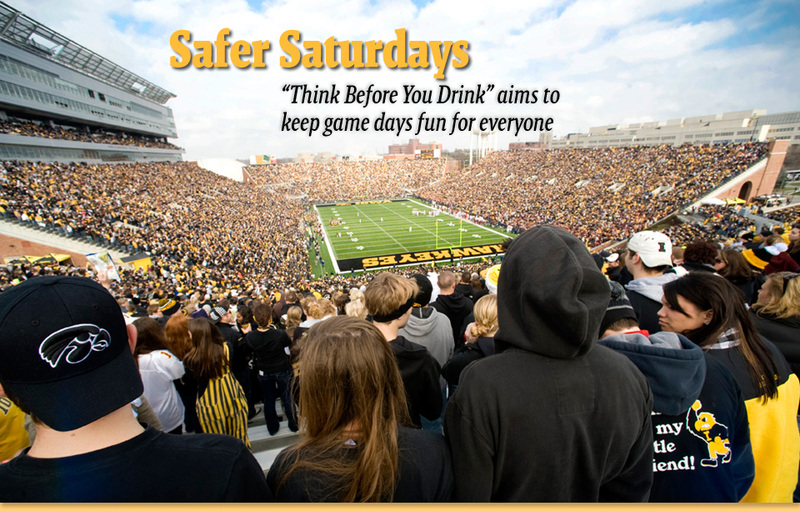 To help make the 2010 season a complete success, The University of Iowa is launching a new initiative aimed at making game days exciting and safe. “Think Before You Drink. Before the Game. During the Game. After the Game.” is the message of the new campaign, which seeks to reduce bad behavior linked to drinking. It involves a wide range of University offices, in cooperation with community leaders and law enforcement agencies, working together to enforce some new rules and step up enforcement of others. The emphasis on safe and responsible alcohol consumption is part of a larger UI and Iowa City effort to move the UI alcohol culture closer to the national norm, says Tom Rocklin, interim vice president for student services. “Think Before You Drink” comes on the heels of a vote by the Iowa City City Council to implement a rule that allows only people over the age of 21 in bars after 10 p.m.
Rocklin explains the scope of the problem by noting that nearly a quarter of UI undergraduates report having suffered physical injury as a result of alcohol use within the last year. That’s one and a half times the national average. • Consumption of alcoholic beverages in UI parking lots and ramps will be allowed for only one hour after each game, and all tailgaiting activities must end two hours after the game. In addition, no after-game consumption of alcohol will be allowed for the Oct. 2 night game against Penn State. • After the the game, police will focus on impaired drivers, establishing vehicle safety checkpoints, increased road patrols, and OWI enforcement teams. The UI encourages all drivers to be safe and sober on their way home. • Iowa City’s open container ordinance will be strictly enforced. That law prohibits people from carrying open beer, wine, and “hard” lemonades on public sidewalks and roads.